doing our part to save this Planet and Ourselves! Going Green , Organic Living, Green Living --these have been passions for me most of my life. And yes, they are important ingredients for Anti Aging Inside And Out!! This is one of my favorite pages, and I look forward to what each of you has found to be fabulous as well!!! With just a little effort, each of us can be going green & living organic. A Wall-o-Water is a great plastic devise with little channels that you fill with WATER; it makes a happy Tipi for protecting tender plants from early frosts. This meant you can PLANT SOONER IN THE SPRING!!!!! Walls of Water are useful devices to extend the growing season for tomatoes, peppers, eggplant and other warm-season vegetables. The channels of water in the sides of the plastic cone absorb heat from the sun during the day and radiate it back to the plant growing in the cone at night. How we looked forward to Daddy's organic veggies in the summer and fall---and beets and carrots carefully protected by straw for winter eating! We still do a small garden for those fabulous fresh veggies! Living Off-Grid, I am always looking for great ways to save energy. 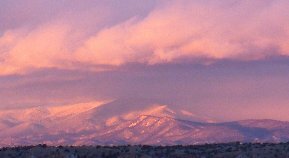 Before adding many more Solar Photovoltaic Panels for our fabulous Solar Electricity, I used quite a bit of propane; but the cost is approaching 10x what it was when i first built my home in 1977. Now i do as much as possible with our Electricity From The Sun, Going Green! My husband bought a Waterless Cooker in the 1970s and has had it ever since. The brand name has long since worn off, but he does remember getting at an Expo of some kind---where they do demos. Going Green can be easy as well as fun---saves money and the environment all at the same time! Closely related to this is the Pressure Cooker! Having grown up at 6100 feet, pressure cookers were a must---unless one wanted to endlessly boil potatoes, artichokes, pot roasts, corned beef etc. 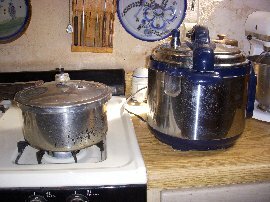 I still have my old Presto Stainless, it's about 40 years old now...... but once again, I went on a search for an Electric Pressure Cooker. At first I was looking to save propane and use more Solar Electricity, but since it was automatic, i no longer had to watch the timer---ever get distracted and let things burn? Well, this fabulous new pressure cooker eliminated that! And what can i say about this Fabulous Electric Tea Kettle? WOW WOW!!!!! When I first got it, I did an experiment. 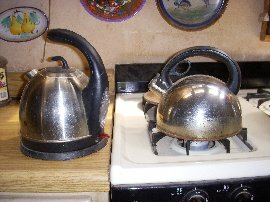 One quart water in my faithful Revere Ware tea kettle, one quart in the new electric one........ the electric heated in 1/3 of the time! And it shuts off automatically....... remember that distracted thing I was talking about? LOL!!!!! OK, i fell for the ad in the magazine while waiting for the oil change in my car...... it sounded great, but you know these ads, usually worthless.... but THIS IS FABULOUS, and added to my pursuit of going green! Once again, no timer waiting for pasta to boil (or boil over as the case may be); just add boiling water from the wonderful electric tea kettle, set the timer for about 15 min., and you have perfect pasta every time! We have used it for asparagus and green beans too, and just a couple of minutes' ''cooking'' and they are perfect!! Simply place pasta in the Pasta Express,pour in boiling water to cover the pasta,press the Secure Strainer in place,pop on the thermal lid and the pasta cooks right before your eyes in minutes, with no stirring, sticking or burning! 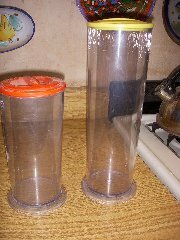 Then, remove the lid, and quickly drain the water through the Secure Strainer top! It’s fun, fast and easy! Pasta Express isn’t just for pasta! Cook healthy, garden fresh, low-fat vegetables to perfection without boiling all the nutrients and flavor away from corn, peas,broccoli, asparagus and more! A watched pot never boils, but this is no pot it's an ingenious container that cooks while you watch. Just add pasta, seafood, eggs, or veggies; fill with boiling water; and cap with the thermal lid that helps maintain ideal cooking temperature. When it's ready, tip over to drain...then serve. Easy cleanup it's dishwasher safe. Heavy duty plastic with insulated thermal wrap. Includes two sizes (12" high x 4 1/2" diameter and 8 1/2" high x 4 1/2" diameter) and 16 page recipe book. Pasta Express, check it out! Many years ago i bought 100 washcloths at a Dollar Store, and most of them are still in fabulous shape. I have a lovely bowl on my shelf where i keep the clean ones, and a cute bag into which the dirty ones go. I estimate that I have saved Thousands of $$$s over the years, not to mention the forests of trees!! Going Green helped again. OK, I do have a paper towel roll in the drawer just in case there is something so gross that I don't want to do anything but TOSS! This is such a rarity that I feel great about helping out the environment just a tad!!! Being a very busy person and not much into taking time for cleaning, I needed something that really worked...and I found it! Actually, found it in 1973, but New Technology Foaming Bottles made it better than ever!! 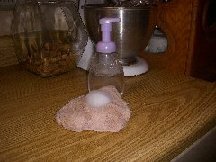 Foaming Bottles assure that very dilute cleaners are NOT watery, but foamy and fabulous! Pre-packaged cleaning wipes can be quite spendy, but not these! My great friend Washcloths, and my great friend organic super concentrated cleaner! And what helps keep these washcloths clean and it great shape? As well as the rest of my kitchen? Can you believe it? Going Green can cost you only $30.05 (before taxes and S&H) This bargain gives you a 16 oz. 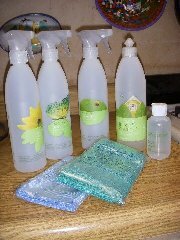 bottle of Organic Cleaner Concentrate, 3-pack special sprayers, dropper bottles, and 2 amazing MicroFiber cleaning cloths, one for those pesky windows & mirrors that love to streak, and one for general cleaning, and my great friend, the 2-sided Super Sponge (EACH ONE machine washable). Everything you need to do a thousand jobs around the home and barn, going green all the while! An unbelievable 48 gallons of super-safe, really powerful, double-concentrated clean---all from this little 16-ounce bottle. Just try using it up any time soon. This cleaner literally gives you a thousand ways Green Clean! Some suggestions: Greasy stove back. Bug guts on the window. Dirty countertops. That’s three down. Only 997 uses to go. Available in 64 oz. as well....WOW WOW, 384 gallons of powerful cleaner---only PENNIES for a 16 oz. spray bottle. YOU ADD THE WATER! For windows and mirrors: Add 1-2 drops to 16 oz. of water. For all-purpose cleaning: Add 1/4 tsp. to 16 oz. of water. Going Green saves your pocketbook & the environment too! What can i say about the amazing American Clay natural plaster? Talk about Going Green -- American Clay Natural Earth Plasters bring the appealing finishes of Nature anywhere you want to add healthful beauty to your interior walls and ceilings. The owners and founders, Croft Elsaesser and his mom Carol Baumgartel, have been friends of mine for decades. Croft was a little guy when Carol moved to my area, and it was an instant friendship. Their products are SO earth friendly, they may contribute up to 7 LEED credits (8 if you include the recycling area---all of American Clay’s packaging is recyclable), and 5 in most areas….. You can read the entire PDF report on the website. WOW WOW WOW, this is something to use for your own anti aging, natural environment!! Be sure to visit Marta's Going Green Art, made with Recycled Bottles; Gorgeous!!!!! Be sure to visit Dani's great page on Eco Friendly Fashion; something each of us can do to help our planet!!! We Share This Great Passion, Please Share Your Green Story! Most everyone is concerned about our part in helping the Environment and our Great Planet. Please share your comments, questions, tips, stories!!!! !